If you’ve been to any public meeting at Extreme Life lately, you will have heard us mentioning the NCMI Australian Equip coming up from the sixth to the eighth of March. If you’ve been around a little while you know exactly what an Equip is all about, but for many who have only been around a short time, you may be wondering what it is all about and whether you should be considering going to it. An Equip time is all about “equipping the saints for the works of ministry” (as per Ephesians 4:12). It is a time when we will have the opportunity to sit under teaching from the kinds of ministries mentioned there in Ephesians 4. Extreme Life is in a very real and active partnership with a translocal ministry team with an apostolic and prophetic heart. There are many such teams all around the world but the one we are linked with is called New Covenant Ministries International (NCMI). I don’t use the term “partnership” loosely either. We work very closely with these guys in the leading of our local church, involving them in all our major decisions and constantly seeking the guidance and perspective of those on that team that have a wide range of experience and many, many years of successful ministry behind them. We also get behind what they are doing around the world, sending people and other resources to help with all kinds of projects with the aim of producing fruit for the kingdom. For more information on partnering with such a team, feel free to read this fantastic blog entry written by Steve Sudworth: http://churchplantingnow.blogspot.com/2011/12/relating-to-ephesians-4-team.html. So, the Australian Equip is a time when we have the opportunity to gather together with other churches from our nation that also partner with NCMI to receive their input into our lives and churches. An Equip is not a conference with guest speakers that we have invited because their big name will attract a crowd. 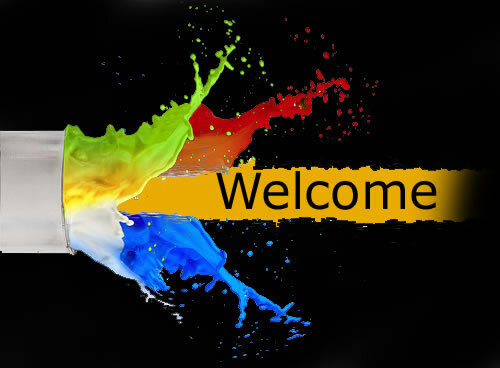 The ministry and input will be from Tyrone Daniel (who leads the NCMI team and resides in the USA since leaving Australia to plant a church in Denver, Colorado), Ron Larson (who leads The River Church in Kansas City) as well as other members of the NCMI team based in Australia and possibly some from other parts of the world. We will also have Aiden and Elouise Whitaker with us (they are part of Grant Crawford’s amazing leadership team at NCF in Pietermaritzburg, South Africa). We structure it like this so that we are equipping the local churches that are represented with those who have a genuine understanding of our DNA as well as a heart to genuinely partner with those churches rather than having a guest speaker who comes in, speaks and leaves and no real relationship is formed or sustained. Further relational growth is made possible by the willingness of these guys who have travelled in from overseas to get into the local churches that invite them to minister there too. We at Extreme Life have Aiden and Elouise on Sunday March 4 and Ron Larson on Sunday March 11. Again, it is all about equipping the saints for the work of ministry. The guys are not just bringing their favorite sermon or their pet topic or just coming to promote the sales of the latest book or CD. It is not about just providing some loud voices with big audiences, it is about those with experience sharing their experience and knowledge so we can all function more successfully. The Biblical pattern for those who are fathers (whether speaking naturally or spiritually) is to show how it’s done, then to help us do it and then to let us go and do it. The Equip times give an opportunity for some of the showing and helping and so we can all go and do. I know that life is busy and we all have a host of reasons why we just can’t get to such a time. But if you are part of Extreme Life (or another church that partners with NCMI) I really want to encourage you to pray and ask God if he wants you to go. If he says no, then it’s settled. But if he doesn’t then the action really starts. You see, just because he wants you to go, that doesn’t mean it will be really easy and you won’t have to do anything to get there. 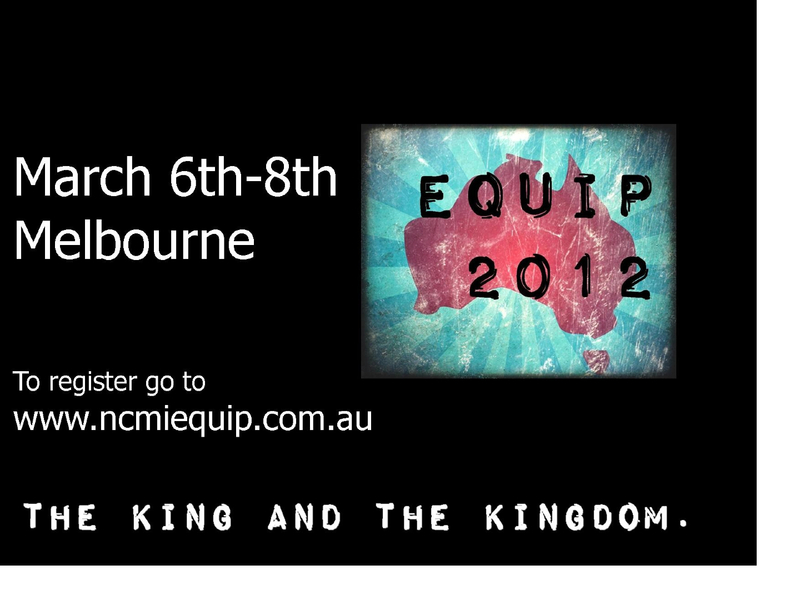 You will need to go to http://www.ncmiequip.com.au and register. That will involve some financial cost. After that you will need to organise some annual leave or arrange for your business to run smoothly without you for a few days, arrange a plan for your kids, arrange accommodation and transport etc. All of which may involve some inconvenience or some cost (whether financial or personal). So many times over the last nearly 20 years, Nicole and I have found that the Equips (formerly know as LTT’s for Leadership Training Times) have fallen at the worst time of year for us for whatever reason and we have had so many reasons why we couldn’t go. We have been the Uni students at the start of a new Uni year, we have been those that have just started new jobs and have no annual leave yet, we have been the new parents with a baby and then with a baby and a toddler or two, we have been those who have just started a new business and simply those who don’t have the time or money to get to something like this. But we have got to every one of them over that whole 20 years. Some have been a bigger faith exercise than others, but I can guarantee you that none has been easy. Once we made the decision to go we then took hold of the challenges, exercised our faith, payed the price and saw it through to completion when we arrived for day one. In 20 years we have made it to these things every year and at most of them we have actively served at either on a worship team, administration team or general serving team. We have even made it to a number of overseas Equips over the years, some of which have some amazing stories of their own. Has the investment been worthwhile? Absolutely! Which is why yet again this year, we are paying the price and organising ourselves and our family so we can be there and serve and participate with all we have. If you would like to go, make the decision, register, then make whatever plans and arrangements you need to (keeping in mind that it will not just come easily and you will need to exercise some faith in this process!) and I will look forward to an amazing week with you there. Some time ago I was looking for a hobby to help me keep my mind off work and on something constructive on my weekly day off. Being a very keen drummer, it seemed only natural to find something that involved one of my very favourite past times. I headed in to Noise Music and acquired an old traded in drum kit that I modified into a practice kit for myself (see pic of original project). Quite happy with the end result, I gave it away and set out to find another one. As I took on more projects, my confidence grew and I found myself getting more and more adventurous in my attempts. A joint effort between myself and Noise managed to find some manufacturers shells on Ebay that were used for displaying available finishes. As such, they were not drilled and were in the perfect condition to be used for whatever we wanted. So I took them to see a good friend of mine that has a huge industrial saw, and he cut them up into various depths for me so they could be made into snare drums (various snare photos). Having enjoyed some success with some snare drums, I set out to renovate and restore a Premier Artist Birch kit I also managed to acquire from Noise Music after another great mate of mine had finished using it as a teaching kit (See pic LTTN Kit). Once finished with that one, it went to Life To The Nations, a church in Melbourne lead by more good friends, Matt and Elodie Doty. Something I have always wanted to do though, was to restore an old vintage kit…enter the Star (See Star pic). Star drums were around in the sixties and later became known as Tama. The particular kit I managed to secure was from about 1964. It was a bit of a mess, but nothing my newly learned skills and quickly growing confidence weren’t willing to have a crack at. So I stripped the drums back to bare shells, sanded the old stringy wood to a super fine finish, re-cut and hand sanded the bearing edges and re-wrapped them in a lovely finish from Jamminsam.com. All the hardware was cleaned , polished and replaced and finally some lovely Fiberskyn heads were fitted to finish it off “old school” (see pic of restored Star kit). A number of kits have been refurbished since. Some added to my personal collection, some sold and one or two given away. All of this to say, that recently on my holidays I was quite keen to rip into another project and dug up enough parts to bring this little beauty to life (see pic of holiday snare). Not bad for a couple of days R & R I have to say…sounds great too! This is definitely a hobby I intend to maintain, firstly because it is the first one I have ever had that has actually put any dollars back in my pocket and secondly because I thoroughly enjoy it…both the process and the end result. I get such a sense of satisfaction every time I finish every part of the process, acquire a new skill and particularly when it is all finished and I get to hear it. What a way to spend the odd day off…at least until I get a new murdercycle anyway! I may post some pics of some more projects another time, but enjoy this gallery for now. Hi, this is my new blog page. I have primarily set this up so we can link it to the Extreme Life web page so that the notes I used to write on the Extreme Life Facebook page can be made available to a wider reader base than just those who use Facebook. Cam and his team have made that link on the church web page and links will also appear on our Facebook page whenever new entries are made. I have now also imported those old Facebook notes onto this page so that everything is all in the one place. Thanks for your time and attention as you read these entries, I hope you find them helpful.